Up until the very end of the picture, Dead Man Down is a mostly serviceable crime drama. It has fine work from Colin Farrell and Noomi Rapace along with worthwhile supporting turns by Terrance Howard and the always appreciated Domonic Cooper. It doesn't set out to turn heads or reinvent the wheel, but it tells its grim story of revenge and tortured romance with just enough aplomb to merit a casual viewing. But oh that ending... I have no idea what screenwriter J.H. Wyman or director Niels Arden Opley were thinking and I can theoretically give them the benefit of the doubt that they just couldn't decide on a thoughtful finale. I'd like to think they just gave up and went on 'bad screenwriting autopilot.' It's frightening to think that these two professionals thought that the last reel constituted a worthwhile conclusion to their otherwise worthwhile yarn. It's tough to review a movie where your biggest gripe involves the very end without actually revealing what happens at the end, so maybe we'll get to that later. The proceeding 95 minutes or so tell the interlocking stories of Victor and Beatrice, two neighbors from across the street who form a connection of sorts over their shared pain. Beatrice is visibly scarred from an encounter with a drunk driver while Victor's trauma is kept hidden from us for at least the opening reels. We learn pretty quickly that Victor has been undercover of his own accord with the local organized criminals led by Alphonse (Howard) and Gordon (Armand Assante) and Beatrice uses at least a portion of this information to blackmail Victor into exacting revenge on the man who wrecked her face. It's not always plausible that a simple engineer with a background in the Hungarian military would have the skills and smarts to enact a rather complicated revenge plot, but Ferrell plays it low-key and doesn't really over-explain his character's disposition. The film has a few worthwhile action beats and refreshingly gets most of its slam-bang action out of the way in the first act. But with the chips laid out and the characters properly established and the stakes appropriately raised, the film completely goes to pot in its final reel. The film (generalized spoiler warning...) dives headfirst into both misogynistic cliche and implausible spectacle, wrapping up its story not with character-driven pay offs or even the promised execution of a grand scheme, but with pointless violence and utterly bland carnage. Moreover, the film commits grand-scale cheating, spending most of its running time discussing the morality of its heroes' respective revenge schemes and then granting absolute and unquestionable moral license to play out 80's/90's action-hero fantasies. It's a shame, as the film mostly works up until then, offering the twin pleasures of Howard's low-key menace and a tense subplot whereby Cooper unwittingly tracks down secrets that may spell doom. It is rare to see an otherwise decent film so brutally shoot itself in the foot in its final lap, but Dead Man Down completely blows all of its goodwill by virtue of its moronic conclusion. 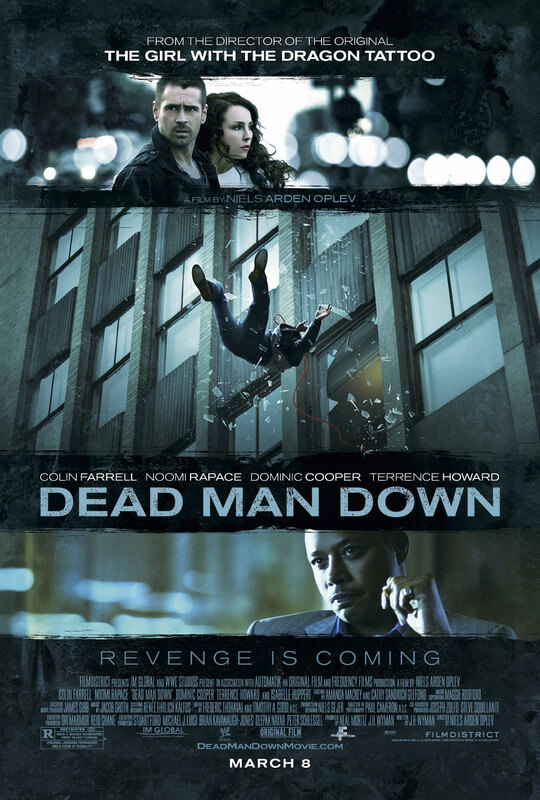 Up until its finale, Dead Man Down is a halfway decent B-movie action drama that gets by on atmosphere and its cast of characters. But its laughably dumb conclusion ends the picture on such a stupid, false, and tonally inconsistent note as to render the whole project asunder. That the ending is so botched is arguably a tragedy. But the ending is so botched and the film is so fatally harmed by its finale that in the end I'm merely glad that Dead Man Down wasn't a truly great film up until that point.